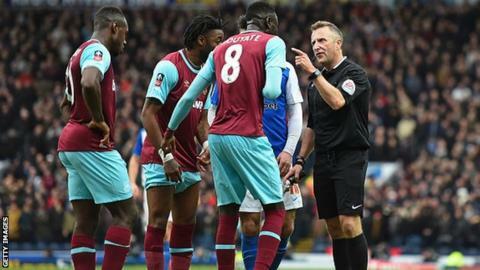 West Ham United will contest the red card Cheikhou Kouyate received during Sunday's 5-1 FA Cup win at Blackburn. The midfielder, 26, was dismissed when he clipped defender Adam Henley, who was looking to race clear at goal. "Yes, we will appeal Kouyate's red card, which we believe was a mistake by the referee," Hammers co-chairman David Gold wrote on Twitter on Monday. "The Blackburn player wasn't going to get the ball anyway so he wasn't denied a goalscoring opportunity." West Ham have been drawn away in the quarter-finals to the winners of Monday's match between Shrewsbury Town and Manchester United.